Robert Cannon will be greatly missed by his family, his many friends and the numerous clubs and organisations he has been involved with during his 83 years. Robert lived at Redbrae, between Kirkcowan and Wigtown, which he had farmed since 1968 having previously been close by at Little Torhouse. He will probably be best remembered for his contribution to the community through local agriculture, Church and his keen interest in sport. At an early age he was a stalwart member of the Young Farmers progressing to the Agricultural Society. Up until 2008 he provided the commentary at the Wigtown Agricultural Show. He was also the prime mover in saving the Annual Ploughing Match when he took over as Secretary and continued to write reports for local papers about the matches until recently. Grange Carpet Bowling Club which he set up. Young Curlers Club which he set up to encourage young players to keep the sport going. Robert was also an active member of the congregation at Kirkcowan Parish Church for over 50 years and was its senior elder. His dedication and commitment to the Community, family and friends will be greatly missed and our thoughts are with his wife Mona, children Sheila, Roy, Jim & Stuart and his nine grandchildren. In September Margaret celebrated her Golden Wedding but sadly died, in her 80th year, only a few months later in January 2012 after a long illness. Margaret and husband Jim were living near Girvan and were great grandparents. Margaret's parents farmed Balgreen farm for many years. Our thoughts are with Jim and the whole family, some of whom still live in Kirkcowan. Well known resident of the village John McQuaker has died. 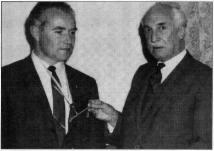 Jack (on the left) receiving The Siller Gun Shooting Trophy. salesman he remained with the company until he retired - by then the company was owned by Carr's of Carlisle. Although the company wanted him to stay on Jack wanted to spend more time on his many pastimes - this he did for 20 years. On February 4th 1950 Jack married Betty McKeand in the Crown Hotel Newton Stewart and went on to enjoy 62 years of married life, celebrating their diamond wedding in 2010, the congratulatory card from the Queen being the highlight of the day. His love of the countryside led him into fishing and shooting. He was a very competent angler and enjoyed fishing for trout in the rivers and lochs of his beloved Galloway. He became a leading exponent of clay pigeon shooting and won the Siller Gun, reputedly the oldest trophy in Scotland. He also took part in game shooting with his devoted dog Sam who was as well known as Jack throughout the district. After he retired he particularly enjoyed bowling and continued to be a spectator long after he was unable to participate. His other abiding interest was bridge and as a member of at least two Kirkcudbright clubs he played both locally and at county level. In his youth he and Betty were motorbike enthusiasts before progressing to cars. He recently achieved his ambition to own a Mercedes and he did in fact drive his dream machine the day before he died. Jack leaves behind his widow Betty, a very close family and an extensive circle of friends and associates with whom he came into contact during his long and active life. Generations of Malcolm's family came from Kirkcowan, he was very proud of his roots and returned often. Malcolm left a legacy of his stories of his days in Kirkcowan, his home, childhood, school and church. These have been passed down to his children and grandchildren who will remember fondly the stories,characters and places from the early years of Malcolm's life. His family would like to thank Kie Stewart for his friendship and for involving him in the website, it meant a lot to Malcolm. David was the son of Robert Rae. Robert, together with his two brothers, had a Baker's Shop in the village. David attended Kirkcowan School and the Douglas Ewart High School (DEHS) in Newton Stewart. He was a keen footballer and often represented the Douglas Ewart. In the 1956/7 season the DEHS Intermediate X1 team won the Hunter Shield and Stewartry Cup. David was one of the six Kirkcowan boys in that team (see Little Known Facts). David died in April 2009, at home in Kirkcowan, after fighting Acute Myleoid Leukaemia.